Low cost organic produce available twice a week on campus. Find low-cost organic produce at the Quarry Plaza and Rachel Carson College during winter quarter. This winter, you can find affordable organic produce from the UC Santa Cruz Farm and local organic growers at two campus locations. On Mondays, the Pop Up is open in the Quarry Plaza from 10 am to 2 pm. The new location at Rachel Carson College is open on Thursdays from 10 am to 2 pm. Cash, check, and EBT credit are accepted at both locations. During winter quarter the Pop Ups will be open through March 8, and re-open during spring quarter. 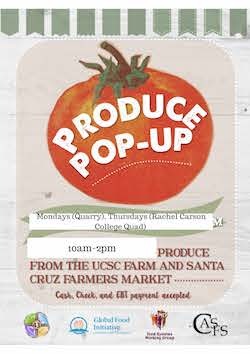 The Organic Produce Pop Ups are sponsored by UCSC's Food Systems Working Group (FSWG), Center for Agroecology & Sustainable Food Systems (CASFS), Measure 43, and the UC Global Food Initiative. For more information or to volunteer, contact Nancy Yang, Food Access and Student Engagement Coordinator.